For years now, leaked toy images have given us a first look some of the most exciting characters, vehicles and new weapons in any given franchise. 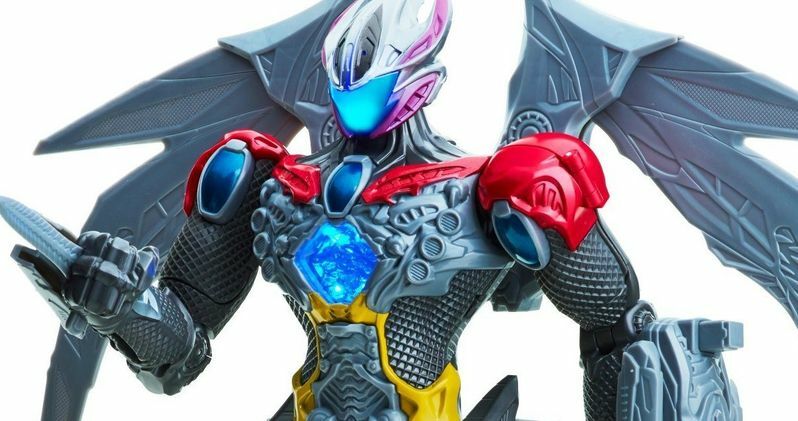 Lionsgate and Saban have decided to beat leak happy merchandizers at their own game by delivering an official advanced look at the upcoming Power Rangers toy line. And in doing so, they have unveiled something very cool that fans have been dying to see. Yes, Lionsgate and Saban have debuted a 100% official look at the new Megazord. At least in toy form. They did so on the their company owned Twitter. And it's pretty cool. Lionsgate and Saban had this to say about this hulking piece of impending plastic. "Interactive #PowerRangersMovie Megazord with expandable wings, battle sounds, LED effects + all 5 Rangers. Stay tuned for pre-sale dates!" It's expected that the new Power Rangers will get a quite robust toy line, as the original TV show made lots of money off of merchandizing. Lionsgate and Saban haven't announced a full-length trailer yet. But they did deliver a teaser during New York Comic Con. It didn't bring us much in the way of seeing these superheroes in action. Instead it focused on the interrupted high school careers of its five lead characters. Hopefully, the next sneak peek shows us the Megazord in action. The Power Rangers cast includes Dacre Montgomery (A Few Less Men) as Jason the Red Ranger, RJ Cyler (Me and Earl and the Dying Girl) as Billy the Blue Ranger, Naomi Scott (The 33) as Kimberly the Pink Ranger, Becky G (Empire) as Trini the Yellow Ranger, Ludi Lin (Monster Hunt) as Zack the Black Ranger, and Elizabeth Banks (Pitch Perfect, The Hunger Games franchise) as Rita Repulsa. In addition Bryan Cranston ("Breaking Bad," Godzilla) has been announced to play Zordon with Bill Hader (Saturday Night Live) voicing Alpha 5. Directed by Dean Israelite (Project Almanac), Power Rangers is written by John Gatins (Kong: Skull Island, Real Steel), Burk Sharpless and Matt Sazama (Dracula Untold), Zack Stentz and Ashley Miller (X-Men: First Class, Thor), and Max Landis (Chronicle). Producers are Power Rangers creator Haim Saban, Brian Casentini, Wyck Godfrey, and Marty Bowen (The Twilight Saga, The Fault in Our Stars, The Maze Runner franchise). Take a look at the updated Megazord.